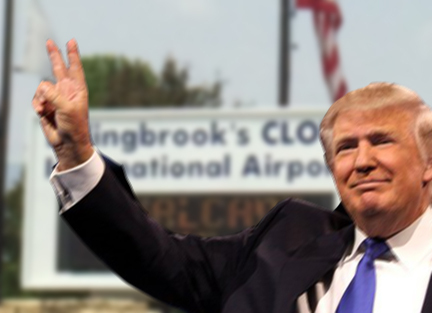 Speaking outside of Bolingbrook’s Clow Airport, Republican Presidential candidate Donald Trump promised to deport all space aliens from Earth. Trump also launched a verbal attack against the Martian Colonists. Trump also attacked Mayor Roger Claar. Despite the fact that a majority of residents either work for Clow, or have jobs related to alien activities, Trump was not worried about losing the Bolingbrook vote. Sources within the New World Order note that the President does not have the authority to shutdown UFO Bases. All UFO bases on Earth are fully or partly administered by the New World Order. When reached for comment, Claar said he doubted that Trump would win the nomination. God to spare Bolingbrook this week.